MSMPure™ is the world’s most pure source of MSM. This sulfur-rich nutrient has anti-aging properties that are key components for maintaining structural integrity of joints, skin, hair and other connective tissues. Staying active and healthy while aging is a goal most of us have. Numerous products on the market claim to have unlocked ways to slow down the aging process, but only MSM (Methylsulfonylmethane) has a 25-year history of providing nutritional support for joints and connective tissue to support healthy aging. MSM reduces inflammation in the joints by inhibiting pro-inflammatory mechanisms in the body. Glutathione, a key antioxidant, relies on sulfur to work properly in the body. MSM plays a critical role in detoxifying the body by regulating the production of glutathione. Is MSM the fountain of youth mineral? Sulfur is recognized as a crucial dietary nutrient that supports healthy aging. 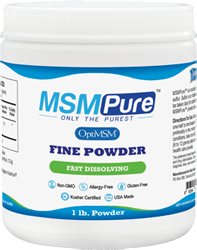 Since MSM is sulfur rich, it does help maintain healthy joints and cartilage, nourishes skin, increase joint mobility, and reduces inflammation in connective tissue. Skin ages more rapidly due to unhealthy lifestyle choices. Poor nutrition, sun worshiping, and environmental toxins are all contributing factors. MSM helps slow the signs of aging skin by supporting key nutrient production and reducing inflammation related to the breakdown of dermal collagen. Glutathione is a critical antioxidant involved in detoxifying and reducing free radicals in the body. Without the presence of sulfur, glutathione is unable to function properly. MSMPure™ contains sulfur that is needed to help regulate glutathione so you have a full battery of antioxidant support.